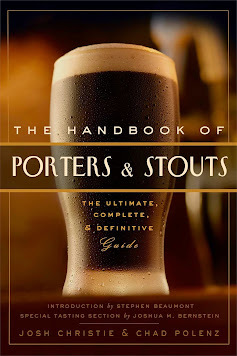 UPDATED: SEP 30, 2012 Dark beer styles such as the bock or the porter lend themselves to a chocolate taste. However, chocolate without sugar or other sweeteners is a very bitter, dry flavor. This is probably why Stoudt’s Winter Ale comes up short as a satisfying winter seasonal – because its chocolaty taste isn’t balanced. One of the reasons I’ve never been a fan of the porter or bock styles of beer is in the way they pour – like water. Stoudt’s Winter Ale pours so smoothly it forms virtually no head at all. What is generated is a very thin, brown, soapy head which dissolves quickly and leaves no lacing on the glass. The complexion of the brew is black opaque with no noticeable carbonation. The aroma is standard for a porter with a roasty, dry, almost liquor-like scent. After my first few tastes of Stoudt’s Winter Ale I felt that I had drank this beer before. It was vaguely reminiscent of other porters, but with a more complex taste. Dark chocolate and some coffee notes seemed to be the most prominent flavors here, but there was no sweet elements to give the taste balance. And these ingredients were only mild as the rest of the palate seemed to be flat and watery. Additionally, the beer has an underlying taste of whiskey, noticeable in the rear of the mouth and especially in the aftertaste. I’ve never understood the concept of brewing beers with even a hint of liquor flavor. If we wanted liquor we’d drink liquor! While I wouldn’t say Stoudt’s Winter Ale is as bad as shots of Jack Daniels or even a whiskey sour, its strong alcoholic content is definitely noticeable in the finish. In fact, it subtracts from the chocolate taste and makes the beer difficult to drink in anything other than sips. I had a heck of a time trying to research this beer. The description on the brewer’s official website is absolutely minimal with no statistics at all, other than to say it’s a full-bodied seasonal whose recipe changes from year to year. Other beer websites describe it as an American porter with an ABV between 5 and 6.5%. There is no indication on the bottles themselves, but having drunk two back-to-back I’d estimate it at 5.5%. Of course, “full-bodied” is definitely an accurate term as the beer does make itself known on the drinker’s system after only half a glass. I wasn’t overwhelmed after two servings, but I was more than content. I have to give the brewers at Stoudt’s credit for using the porter to create an original winter ale since most other brewers opt for brown or scotch ales or even lagers for their seasonals. I think this beer could’ve been a winner had the flavor been balanced and not been so flat, plus the liquor-like elements were pointless. Not that this is a terrible beer since it’s very drinkable, but not very enjoyable.